Gould Music LLC presents an innovative eBook for the iPad for drummers and percussionists. 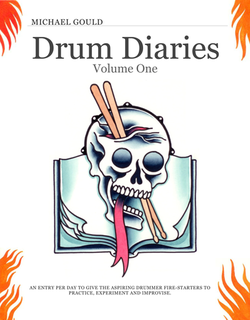 The Drum Diaries Volume One by Michael Gould combines snippets of musical material for drummers to fire-start their daily practice sessions. Every page of the book contains enriched content including audio and video, links and musical examples. Included with each diary entry are helpful practice tips to increase one’s creativity and approach to drumming. Each entry of the book will provide not only short-term material to practice but also a lifetime of learning and fun.